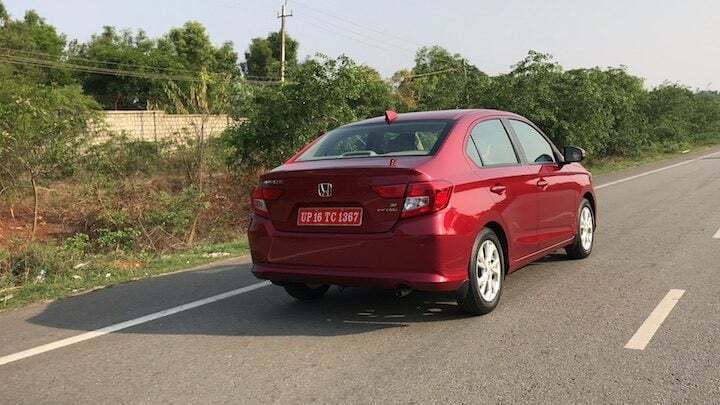 The 2018 Honda Amaze, the second generation iteration of this compact hatchback brings an all-new persona. 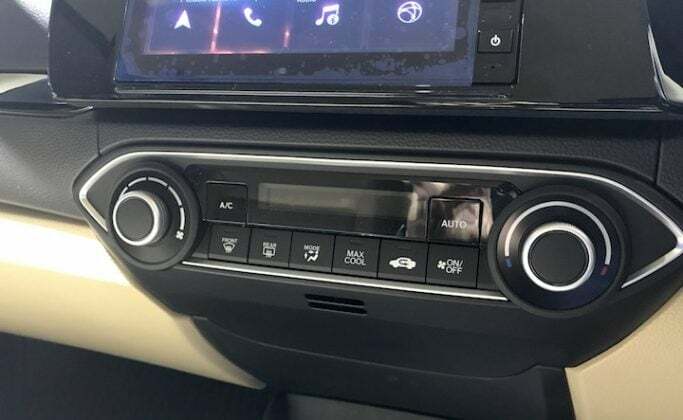 It now comes with a bold design, more features, improved ergonomics and the convenience of an automatic CVT gearbox for both petrol as well as diesel derivatives. 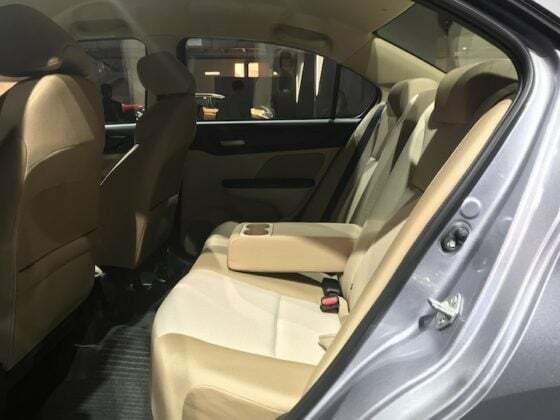 In comparison to the older generation model, the new Amaze offers a premium cabin with improved NVH levels and improved ride quality. It takes the fight to the likes of Maruti Suzuki Dzire and the Hyundai Xcent with more confidence. 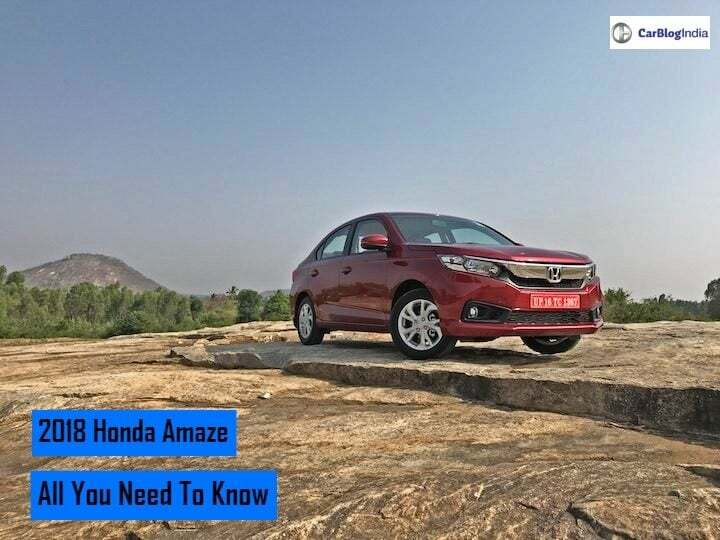 Interested in knowing more about the 2018 Honda Amaze? Read our detailed article on each and every aspect of this compact sedan. 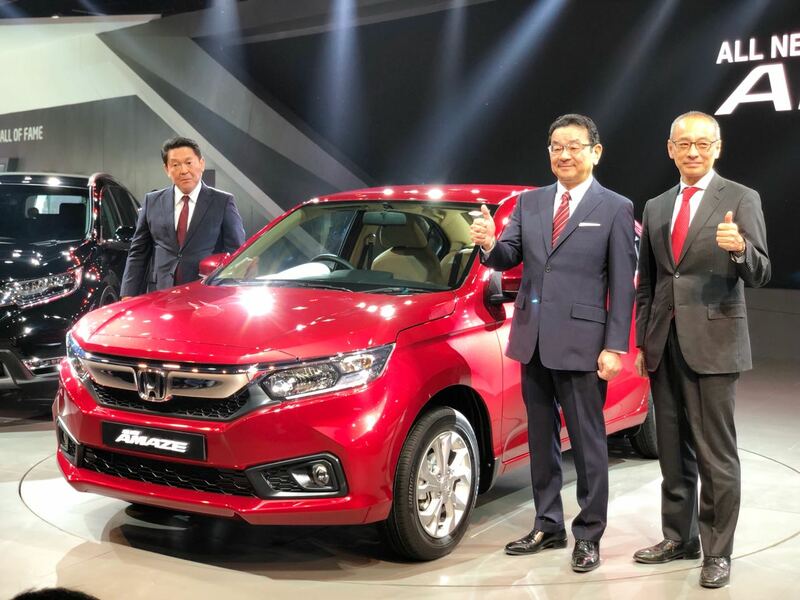 At the 2018 Auto Expo, Honda officials confirmed that the latest iteration of this compact sedan will make its debut in India during the 2018-19 fiscal. 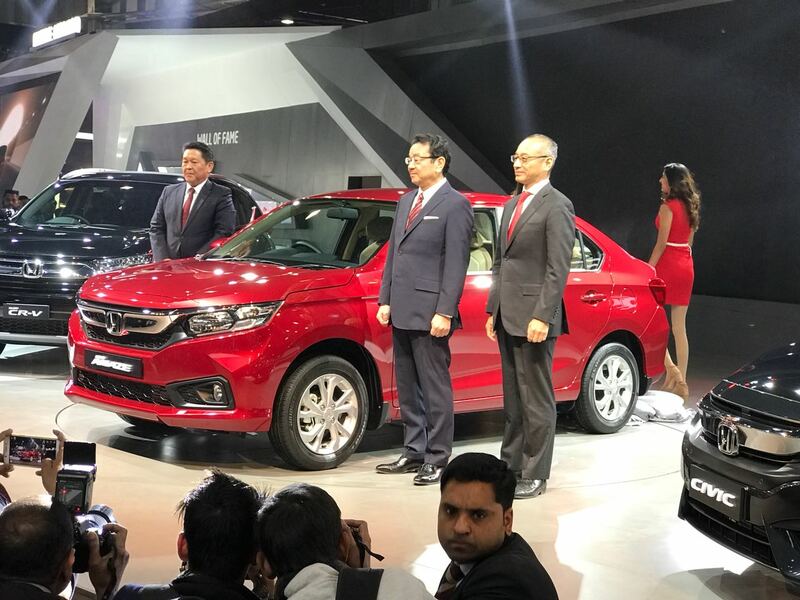 Honda Car India has launched the latest iteration of this compact sedan in India on the 16th of May 2018. Honda has launched the Amaze as a very aggressive starting price of INR 5.59 lakhs for the base petrol variant. The top of the line petrol trim is going to retail at INR 7.57 lakh. The base diesel trim will cost INR 6.99 lakh while the top of the line diesel is going to retail at INR 8.67 lakh. Detailed variant wise prices of this vehicle are down below. 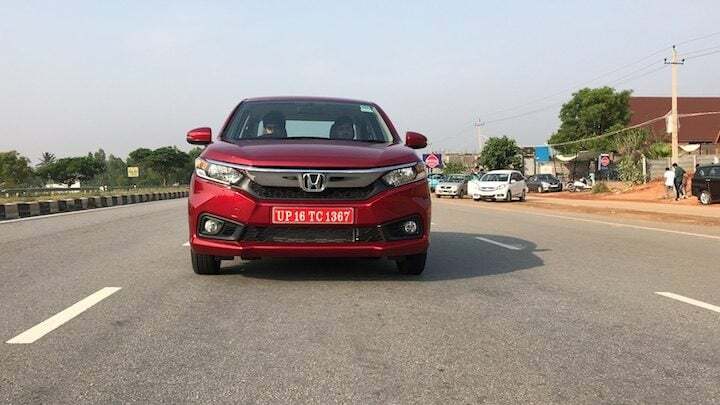 Consequently, the petrol derivative of the vehicle will get a 1.2-litre i-VTEC engine. This motor is capable of producing 87 BHP of power along with 109 Nm of peak torque. While the diesel derivative is going to get the 1.5-litre i-DTEC motor capable of producing 99 BHP along with 200 Nm of peak torque. The next-gen iteration of this vehicle is going to get a 5-speed manual gearbox as standard across the range. Honda is going to introduce a CVT automatic gearbox with the diesel derivative. This will help it stand as a tougher contender against the competition. Honda’s engines are known for their good fuel-efficiency characteristics. 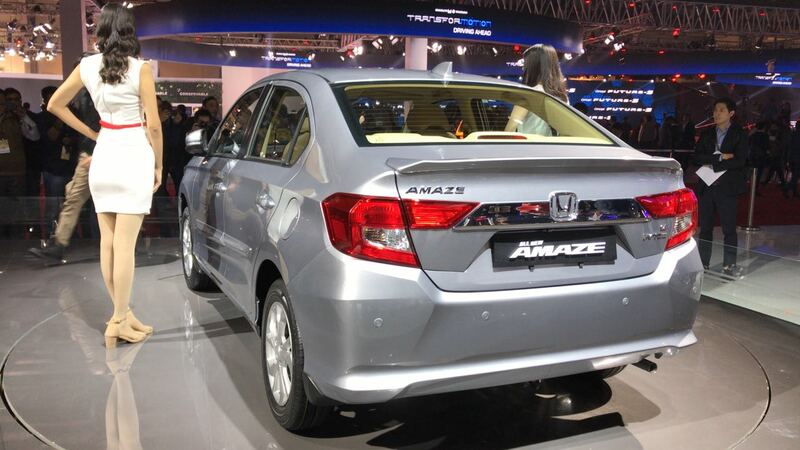 The petrol derivative of the new Amaze is likely to give a fuel efficiency figure of 22 km/l. While the diesel engine will probably promise a mileage figure of close to 28 km/l. The next-generation model of this compact sedan will measure 3900 mm in length. The width will stand at 1680 mm while the height at 1505 mm. The car will have a wheelbase of 2470 mm. 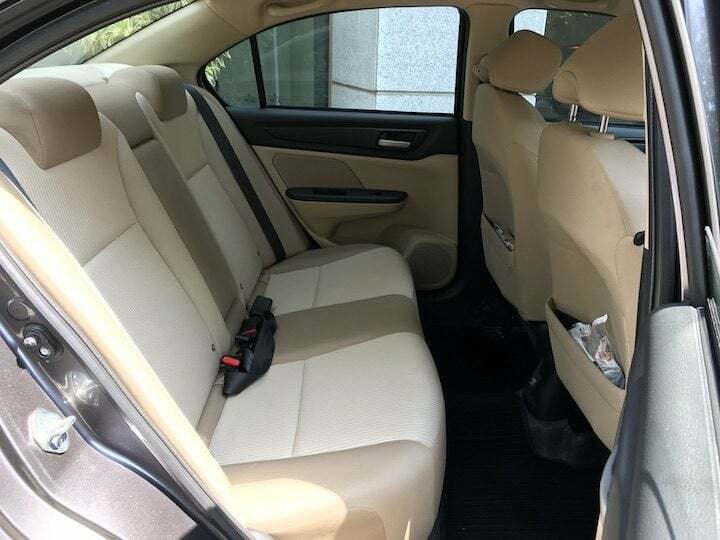 While the boot space stands out at 420 L. This is the largest in the segment. The latest iteration of this sedan is a completely new vehicle in comparison to its previous generation model. It gets a very bold and a lot more aggressive stance. The front profile resembles quite a lot with the current generation City. The car comes with large headlamps and a thick chrome accent on the grille which gives it a dominating look. 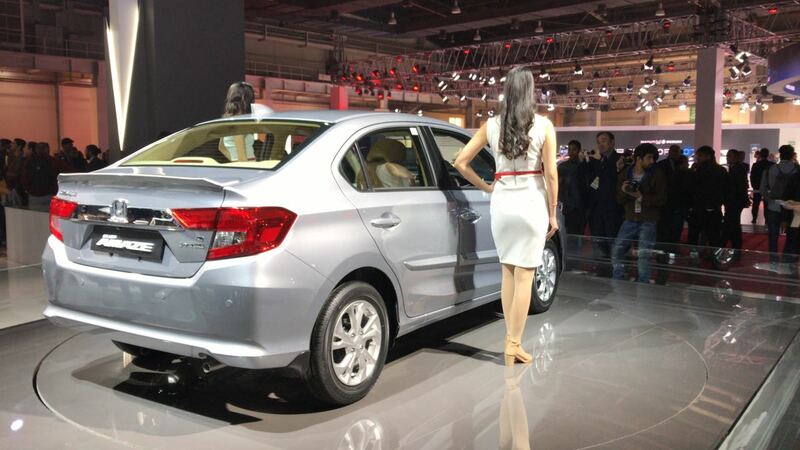 Towards the side, the compact sedan has a very stout look. Yet, as with other Honda cars, it looks very appealing and somewhat sporty. 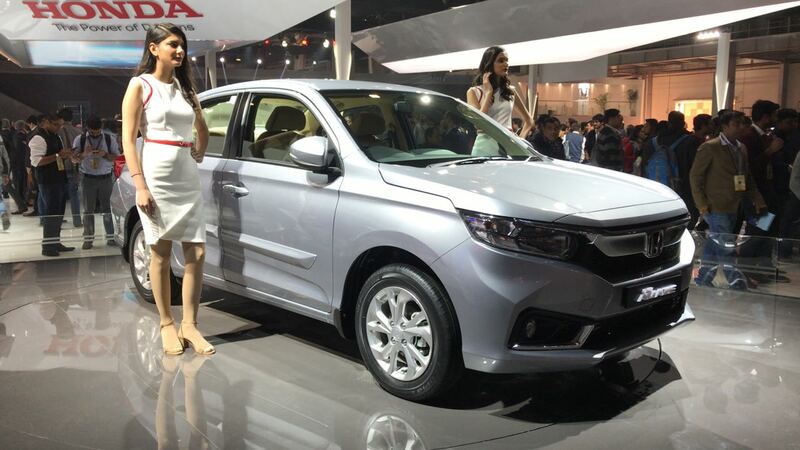 Towards the rear, the new Amaze gets an equally striking personality. However, the angular design of the tail-lamps might not appeal to everyone. Nevertheless, the car looks very modern and crisp from this side. 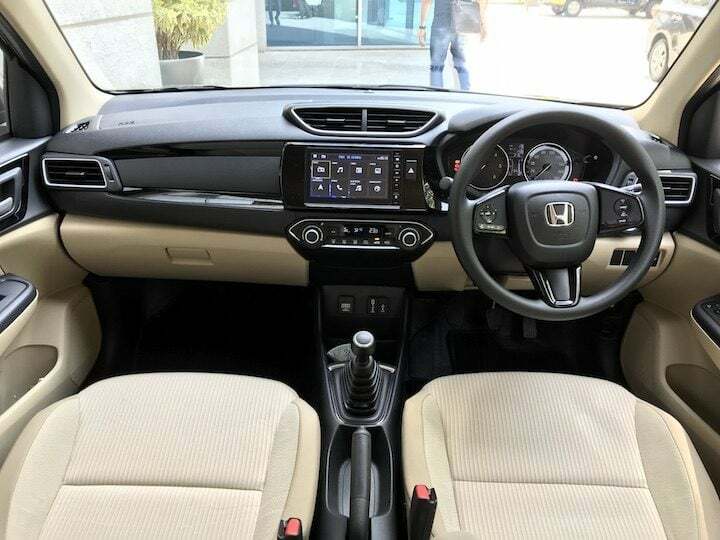 The cabin of the new Honda Amaze is a breath of fresh air. This time around, it comes with the dual-tone colour scheme of black and beige. 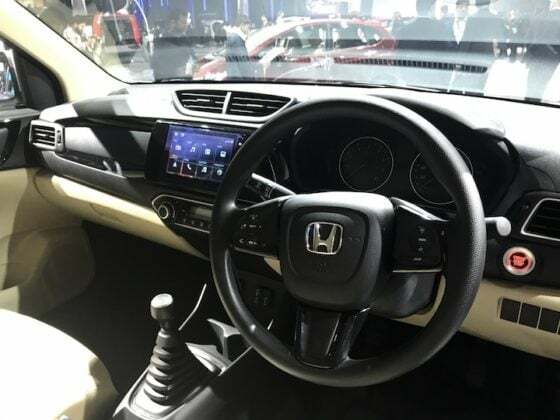 Unlike other Honda cars, the dashboard layout appears to be on the premium side and not sporty. The steering wheel is nice and chunky. While the dashboard also comes with piano black accents which increase the cabin’s overall premium feel. The material quality seems to be on the better side, as with all Honda cars. Overall, you can feel that this car is in line with Honda’s current plan to once again establish itself as the manufacturer of premium cars in India. 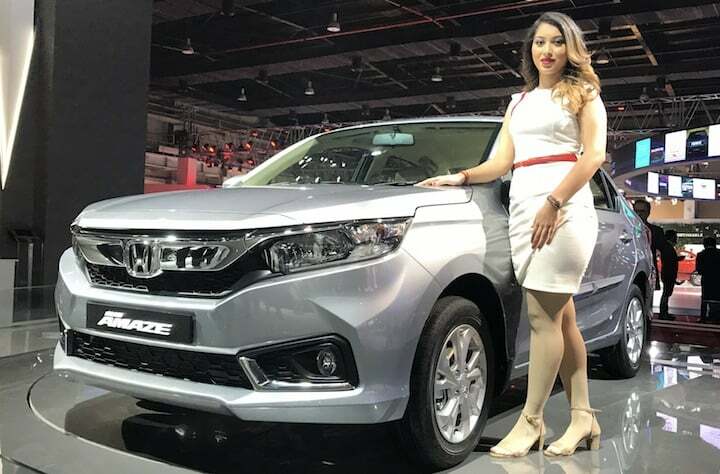 The next-generation Honda Amaze comes with a bag full of onboard features and creature comforts. These include LED daytime running lights, automatic climate control, rear air-con vents to name a few. Furthermore, the car is going to come with rear central armrest, tilt and telescopically adjustable steering wheel to name a few. 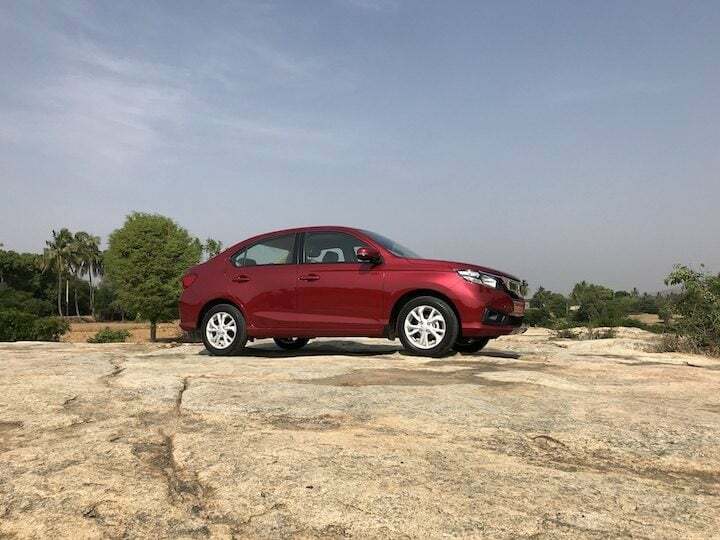 In-line with new government regulations, this compact sedan is going to come with dual airbags and ABS with EBD as standard across the range. Also, the car is going to come with ISOFIX child seat mounts as standard. Range-Topping models will also get Electronic Stability Programme and Traction Control System. It will compete with others cars that fall in this segment. The likes of which include the Maruti Dzire, Hyundai Xcent, Tata Tigor and the Ford Aspire.